From the 1930s to the early 1970s, London had a requirement for low-height double-deck buses, both in the central (red bus) and the country (green bus) areas. The need arose from a desire to have high-capacity buses on routes where low railway bridges prevented the operation of normal-height double-deck buses. In London, the special double-deckers were commonly referred to as “lowbridge” types. By the late 1960s, the much greater passenger capacity of new single-deck buses rendered the low-height double-deckers redundant. By the late 1940s, London’s motley collection of pre-WW2 lowbridge buses was reaching the end of their lives and London Transport faced a difficulty: it did not make economic sense to design a special lowbridge version of the standard RT-type then entering service and LT was not keen on buying ‘provincial’-type lowbridge buses ‘off the shelf’ as these would be very different in terms of maintenance. 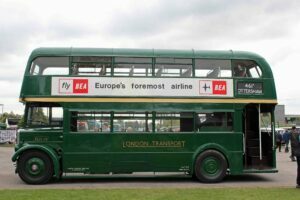 Fortuitously, a solution arose in 1950 when the Midland General bus company found it had over-ordered and therefore 20 AEC Regent buses with Weymann lowbridge bodies became available. Since the chassis were fairly similar to LT’s standard type – they were effectively ‘provincial’ versions of the RT – LT took over the order. The buses proved successful in operation and so LT ordered another batch of 56 for delivery in 1952 which enabled the entire lowbridge fleet to be re-equipped. The RLH chassis may have been mechanically similar to London Transport’s RT-type but the bodies were quite unlike the London standard, having, for example, sliding window vents rather than wind-down windows, with areas of polished wood around them as well as a very different type of seat with a curved back. Nonetheless, the interiors were finished in LT’s standard colours of cream, green and brown, and the seats were upholstered in standard LT material so that a London passenger would feel relatively at home. Lowbridge buses were not particularly comfortable for passengers or conductors. In order to achieve the height reduction of 14″ (36cm) in comparison to standard types, sacrifices had to be made. In particular, the roof was single-skinned and flattened out, such that passengers sitting upstairs had to lean down to be able to see out of the windows. The gangway upstairs was on the offside in a sunken trough which then protruded into the lower saloon, meaning that passengers sitting on that side downstairs were liable to bump their heads when arising from their seats. The upstairs seats were arranged as four persons to each seat which not only meant that those on the inside had to ask the others to get up to let them out but also that the conductor had a long way to lean across to collect fares. Despite these disadvantages, the RLHs had a solid life in London of up to 20 years and only became redundant because new designs enabled a much increased capacity for single-deckers which could then operate the lowbridge routes. 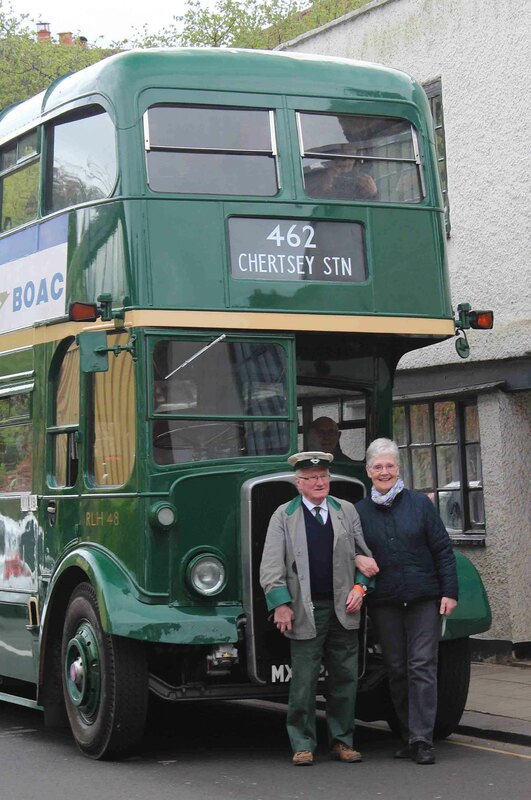 The red buses were always confined to suburban areas such as Harrow, Merton, Stratford and Upminster and the green ones operated in country towns such as Amersham, Addlestone, Godstone, Guildford and East Grinstead. Withdrawals began in the mid-1960s and were completed by 1971. 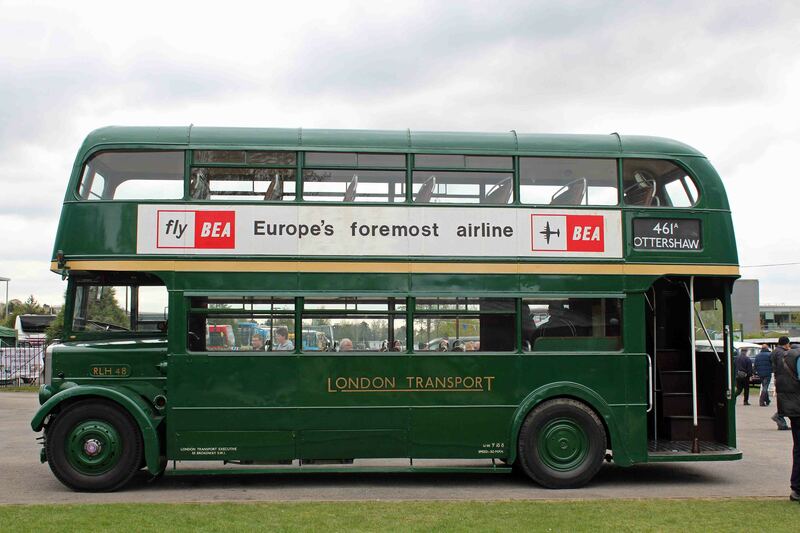 After withdrawal, although some were scrapped, many RLH buses found a second life abroad where the desire to operate red London buses for tourist purposes, combined with the generally lower height clearances in continental Europe and north America, made them readily saleable. Many which had spent all their operational lives in London service wearing green ‘country’ colours now found themselves painted red for service in their new homes. RLH48 was delivered in 1952, part of the second batch. They had minor differences from the first batch for example, polished aluminium radiators rather than chrome, they were fitted with standard LT ‘used ticket’ boxes on the platform and LT’s double-arrow indicators above the rear registration number. Despite these minor adaptations, these RLHs were still very ‘non-London’-looking with their old-fashioned body-styling and small destination boxes. RLH 48 started service at Amersham garage on route 336 and over its 13 year life with London Transport moved to 5 more garages. The vehicle operated on the most number of routes which actually required lowbridge vehicles, 9 out of 12. This included short spells on 2 in the Central area relieving red vehicles at Hornchurch and Dalston garages. 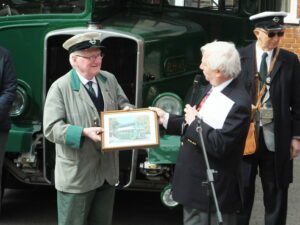 It always remained in green livery. Richard Proctor went to school on RLH 48 when it was based at Amersham garage between 1952 and 1954.